OKLAHOMA CITY (March 29, 2017) – Students in Oklahoma are playing a role in an ongoing effort by the U.S. Department of Education (USDE) to solve a national problem — the critical shortage of students with mastery of science, technology, engineering and math (STEM) skills. Through an innovative out-of-school collaboration between the USDE and NASA, local students are conducting scientific observations of the natural environment and are learning the relevance of STEM skills to daily life. 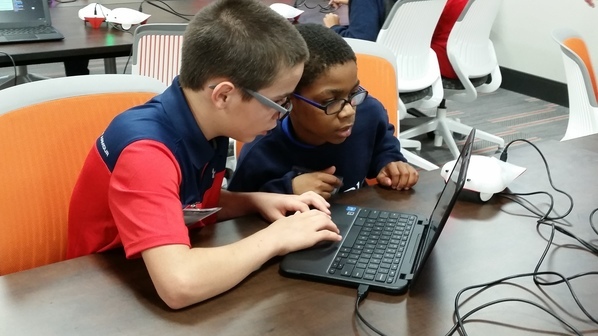 Oklahoma schools are part of the USDE’s 21st Century Community Learning Centers (21st CCLC) program, which focuses in part on exposing students in high-need schools to meaningful STEM learning opportunities. One goal of the 21st CCLC program — which will serve more than 1.5 million students in all 50 states during the 2016-17 school year — is to demonstrate the value of STEM skills both inside and outside the classroom, thereby raising student interest in STEM and related professions. This year, NASA is offering two options for unique STEM experiences: Engineering Design Challenges (EDC) and a Global Observation to Benefit Environment (GLOBE) investigation. EDC introduces students to the engineering design process so they can develop solutions to real NASA challenges, such as how to land a spacecraft on Mars or grow plants in lunar habitats. GLOBE immerses students in scientific investigation techniques, such as data gathering, to learn how clouds impact the Earth’s climate. In both cases, students work with NASA engineers and scientists to receive feedback on their work, learn about STEM careers and find out what it’s like to work in science and engineering professions. Ethan Stone, a 7th grader at Caney Public School, and Qualan Brown, a 4th grader at Kendall Whittier in Tulsa, program a Finch robot in ECU'S STEM lab. At an event held Tuesday in Ada, students presented their findings at the NASA Challenge Showcase. Currently, 93 Oklahoma students are participating in the NASA partnership program. In Oklahoma, 21st Century Community Learning Centers is a part of the Oklahoma State Department of Education (OSDE). State Superintendent of Public Instruction Joy Hofmeister said, the engaging, hands-on nature of this program is exactly what our students need. Since NASA first became a partner in 2013, 21st Century Community Learning Center programs have grown from 20 sites in three states to 146 sites across 15 states in 2017. To learn more about the federal 21st CCLC program, visit: http://www2.ed.gov/programs/21stcclc/. To learn more about Oklahoma’s 21st CCLCs program, click here.